Local Government Officer. Worked for Manchester City Treasurers Department from 1929. His father James was a member of Ince Urban Council in the 1920s and his two brothers Arthur and Henry also served on Ince UDC, Henry for 30 years. Represented North East Ward 1952-58 and North Ward from 1959. 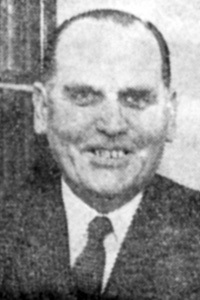 Member of Lancashire County Council from 1965. He was Chairman of the Establishment Committee and served on several other Committees. Secretary of the Labour Group and was Chairman and Leader. He was a member of the Divisional Education Executive Council, on the Sub-committee on the reorganization of Secondary Education and on the governing bodies of Harper Green County Secondary School, Highfield, Cherry Tree and Plodder Lane Junior Schools. He was an active member of Dixon Green Labour Club, being the first Treasurer and was also President. Treasurer of the Farnworth Local Labour Party from 1952. He was a member of the Executive Committee of the Manchester Branch of NALGO. His sister, Mrs Doris Nicholson, was Mayoress. She was also active in local politics, being a member of the Women's Section of the Farnworth Local Labour Party. He was interested in working for old people's welfare. His brother James Topping was Principal of Acton Technical College, London and another brother Sydney Topping was a Headmaster in Luton.